Executive Chef Shawn McCoy, along with Saundra McCoy, Shawn’s wife and fellow proprietor, make it clear that fine dining does not mean stuffy: “I want to make good food that people will remember; good food that is not pretentious,” Shawn said. 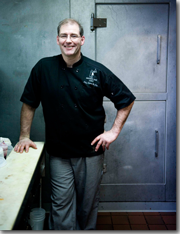 McCoy, who is primarily self-trained, has a reputation for playfulness with not only his contemporary American cuisine, but also with food titles like “Duck, Here Comes Your Venison”. He is primarily self-trained, but began cooking when he was a child. “I began making breakfast – I wanted pancakes that looked like Frisch’s,” he said. McCoy moved from pancakes to more sophisticated dishes by moving very quickly through the ranks at the Marriott in Sharonville. Due to his work ethic, kitchen management style and creativity, he became the Marriott’s executive chef by the time he was 21-years-old. He fine-tuned his craft as head chef at the Academy, a fine-dining restaurant in Hamilton. Additionally, this is where he met his wife and future business partner, Saundra; the couple initiated a catering business while at the Academy. They left the Academy in 1999, but continued their catering business at the Wildwood Pub in Fairfield. They bought a deli located at Longworth Hall, which they named the S&S Railroad Deli. The couple bought the Brown Dog Café in July, 2003. Saundra immerses herself in the day-to-day operations of the restaurant in a variety of ways. She executes marketing and administrative tasks, is a server and bartender, and works at catering events. The couple has now operated the Brown Dog Café for ten years, having weathered a couple of bad years (2008/09) with good fiscal sense, came close to the million dollar mark in both the last two years – not bad for a 60 seat café in the burbs.